In the modern interior relevant curtains that are attached to the ledge using the holes on the top edge. They are decorated with round or shaped pads-grommets. This method of attachment of the curtains allows you to create neat, symmetrical draping. To sew curtain with eyelets can be almost any material from light and transparent tulle, and drape heavy fabrics with a lining. Correctly choose the combination of fabric with grommets. For heavy curtains buy a special ring that will hold the weight of the fabric. It is recommended to combine with clips for curtain rods - these devices will support the curtains and will help you to simulate the drape. Curtains of average weight can be combined with any decorative rings-lining; light blue pick the right color insert of denser tissue, which will weight the top of the curtains. Take enough long and wide curtain. To drape curtains with grommets was successful, you need to consider the classical correlation: two meters straightened the curtains should be meter draping. Note - to install the grommets you will need from 10 to 20 cm stock length to bend the top of the curtains. Calculate the hem according to the size of the adhesive tape for the grommets, and add another 2-3 cm you Can use a striped fabric. Lining on top of curtain required – it will allow the pads to stay tight, and the folds will be more smooth. Treat the side seams of the curtains. Express in its upper part, a small allowance and draw a straight line on which you lay non-woven or a special backing tape. Allowance exactly fold and iron. Then you need to fold the top of the curtains with a lining and carefully removed, avoiding wrinkles on the surface of the canvas. Calculate the required number of grommets. According to the design rules, it must be even, otherwise one side edge of the curtains with the grommets will be inharmonious to stand out. To make the folds turned out the fluid, keep the distance between the holes 15 to 20 cm Top back off about 5 cm; a little, move the grommet from the side seam. Now make the hole. • Cut small holes with sharp scissors. The holes should be 3 cm smaller than the inner diameter of the grommets. Get special equipment for fastening with blind riots of grommets. The lining is composed of a decorative front portion and the lower ring that is supposed to lock with the upper in a sturdy lock. To make this happen, you need to make a considerable effort. You can try to fix the grommets with pliers or hammer, putting the top piece of rubber. However, they could be damaged. 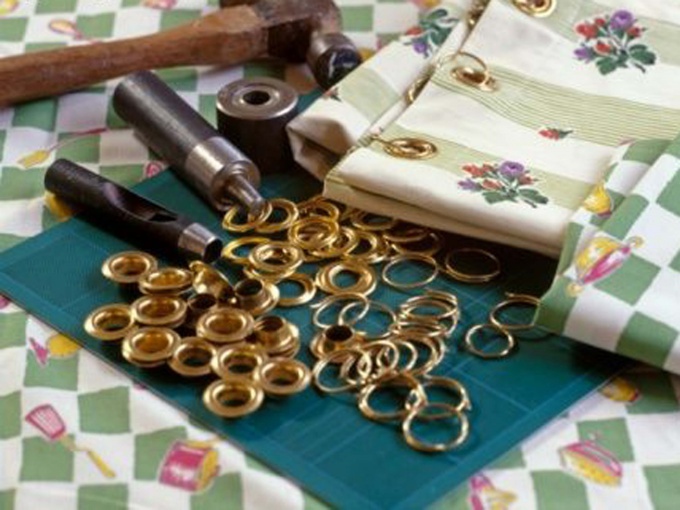 Better buy a special press punch or contact the shop on tailoring of curtains - there you can set eyelets on professional equipment. Put on the reverse side holes on the lower curtain ring top (very accurate!) build out trim. Rivet all of the ring – now you can hang curtains with grommets on the curtain rod to drape his translating the window. If you incorrectly calculate the necessary diameter of the grommets, the curtains will be opened with difficulty. The hole at the top of the curtains should be a little more round the eaves. You can use the grommets on the curtains just for decorative purposes. For this designers are doing on the canvas, holes in random and framed them in a variety of decorative combinations, including braces, pads. For example, you can combine functional rings on the ledge with the eyelets of the same style at the bottom of the curtains.